Showing results for tags 'machine embroidery'. 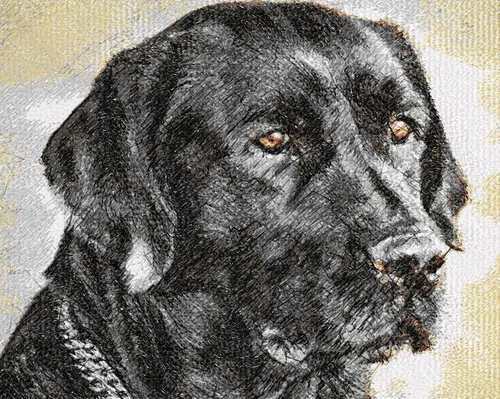 Size: 9.44 x 7.51" Author: Tonito A large dog's head is perfect for decorating a women's bag or pillow. When embroidering, choose a fabric with a dense structure. We recommend using Cut-Away for Jersey fabric and linen (Cut-Away Plus, Fuse'n'Stich, Soft'n'Sheer Extra from Sulky of America). The speed of the embroidery machine 600-800 stitches per minute. Be sure to download the color chart. Accuracy in the use of colors ensures quality results. Hello I paid for the Minion embroidery and some logo My computer crashed and I lost all my files. Can you send me the Minion and Redskin logo again if possible. Festive tablecloth for the table. Used Tiger badge machine embroidery design Use a tight stabilizer to ensure the quality of the embroidery. 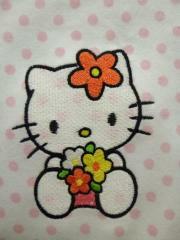 This is a very beautiful embroidery design. It is presented in various sizes. On this picture you may see cool and quite easy idea to decorate child room for those who love cartoon cars. 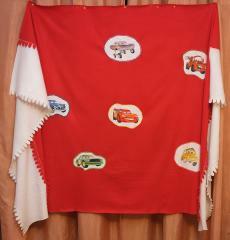 The only things you need is bright piece of fabric, some patience and our samples from embroidery collection of cars. Cars embroidery designs collection includes many pictures indifferent styles so you will be able to choose what you like with your child. Renovation my son old knitted jacketThis photo shows result of renovation old knitted jacket of author’s son. It was beloved clothing which needed some new accent to have new life. 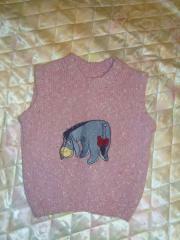 It got it due to Eeyore embroidery design 1. This is well known character from famous cartoon about merry fluffy bear. This donkey was said always but causes sympathy in all children without exclusions. This picture shows close up plan of cool knitter t-shirt suitable for child or teenager who likes popular cartoon about monsters. This work piece is decorated by Monster High Draculaura badge embroidery design. This is portrait of one of main character of this film. This bright picture is added by thematic inscription executed by suitable font with illusion of drips. This is cool embroidered knitted t-shirt in dark color scheme. This work piece will be definitely loved by children and teenagers who like popular cartoon about monsters. That is because this clothing is decorated by Monster High Draculaura badge embroidery design. It is one of main character of this cartoon. Her image is added by thematic inscription made by suitable font. This is stylish clothing set for girl who loves popular cartoon about pretty monsters. 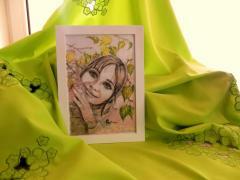 It consists of light blouse with beautiful print and vest of dark fabric with lining from same material as blouse made. 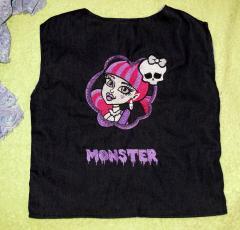 Front side of vest is decorated with Monster High Frankie Stein embroidery design and Rochelle Goyle embroidery design. They are portraits of one of main characters in emblem of cartoon. 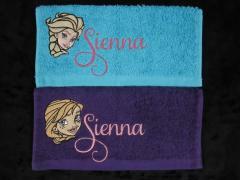 This is nice terry towel designed especially for children. It has not only pleasant fluffy surface which is able to dry skin quickly but also convenient hood not to overcool wet head. 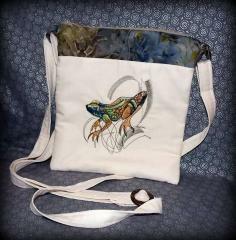 This cute work piece is decorated with funny embroidered picture in cartoon style. It shows circus lion on pedestal ready to jump. This thing will definitely by loved by your child. 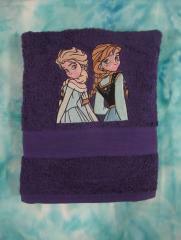 This is nice terry towel of deep bright color. It is very useful thing after bath or at beach. Furthermore due to funny and original picture from well known cartoon it will be definitely liked by your child. 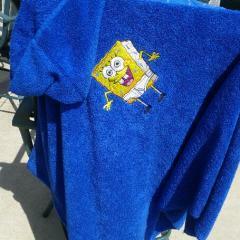 This picture is SpongeBob embroidery design. It will be not only interesting decoration for this work piece but also unique mark for towel.